Telling time and finding elapsed time are very important skills for math as well as for life! If you are using the Grade 3 EnVisions math curriculum, these power points are a great resource to use when teaching each lesson. They allow you to integrate technology into your instruction and use the Common Core based EnVisions skills and terminology to help your students master the skills. The power points are designed to be used as a teaching tool to complement each lesson. * Warm-up for spiral review of skills previously learned. * Literature links for each lesson to help you integrate literacy into math to meet cross-curricular integration standards. * A "Think and Write" to integrate math and writing skills and often make connections between math and daily life experiences of the students. * Practice problems that you can use to demonstrate on the board, on slates/communicators, or in notebooks to engage all students. 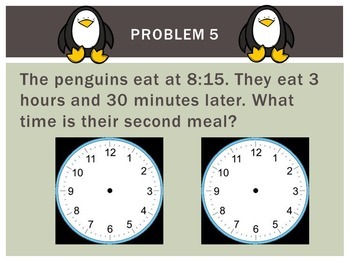 * Word problems to show whether students can solve problems using deeper analysis and evaluation levels of the skill. Some problems also incorporate multiple steps. By observing student responses, you can decide whether students need more review or are ready to move to independent work. It's a great method of informal assessment! 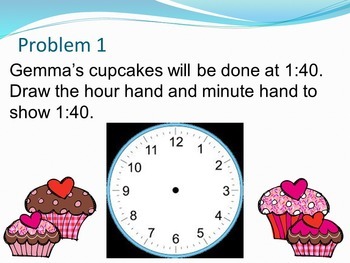 Topic 12 focuses on telling time and finding elapsed time. 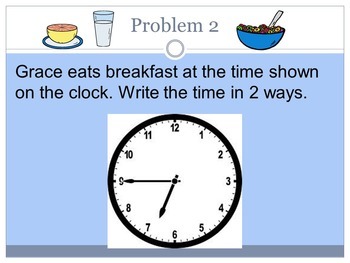 Lessons include telling time to the hour and minute, finding the elapsed time, and working backward to solve problems. These lessons are aligned with Common Core Standard 3.MD.1. If you like this product, you may want to consider the other titles in my Grade 3 EnVisions Math Inspired Power Point lesson series. They make planning and teaching math as easy as, well, 1-2-3!